“Militainment”, which military expert P.W. Singer describes as the “blurring of the line between entertainment and war” is not a new phenomenon. Interacting with pop culture helps the military polish its image and gain recruits. There is an entertainment media division at the Pentagon devoted to advising production on films, television shows, documentaries, advertisements, computer games, and other forms of entertainment. Directors who wish to shoot films with scenes featuring the military request access to equipment and bases from the Pentagon, and in return, the Pentagon “assists” film production. This comes down to reviewing film scripts and advising the film’s portrayal of the military. This helps filmmakers add realism to their films at a cheap price. However, it also tames filmmakers’ vision by pressuring them to ensure that their films do not offend the military or risk receiving no Pentagon support. In “Black Ops II,” Lt. Col. Oliver North, who is infamous for his role in the Iran-Contra scandal, not only advised production but also appeared in the game’s multi-part documentary. Some gamers criticized the fact that North advised the game’s production because of his record. “Call of Duty” creators told Kotaku that North’s consulting helped make the game more realistic. Most military advisors are less high profile. Lt. Col. Hank Keirsey, a retired Army officer, is also a lead military consultant for the “Call of Duty” series. Seven U.S. Navy SEALs advised production for Electronic Arts’ “Medal of Honor: Warfighter.” However, they were later reprimanded for revealing “classified information connected to their tradecraft,” CNN reported. While very different from actual war, there are certainly elements of realism in war games such as “Call of Duty” and “Medal of Honor.” Players can shoot people with realistic-looking weapons, like rifles and pistols, call in airstrikes, shoot from drones, fire AC-130 gunships, and torture people. Some of the video footage from AC-130s in “Call of Duty” look strikingly similar to real AC-130s and even the “Collateral Murder” video released by WikiLeaks, in which a U.S. Apache helicopter killed a dozen Iraqis civilians and two Reuters journalists. In fact, Al-Jazeera English pointed out that a level in “Call of Duty” portrays an “eerily accurate version” of its newsroom. Other levels include locales in Yemen, Pakistan, Afghanistan, and Somalia, countries where the U.S. is waging conventional and covert wars. “Call of Duty” and “Medal of Honor,” in particular, immerse players in the world of special operations. 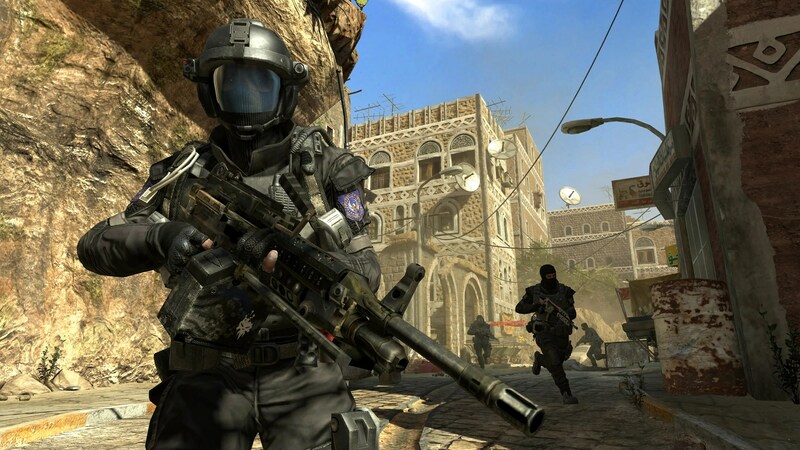 The games’ stories put gamers in the role of elite commandos fighting terrorists around the world. In an advertisement for “Medal of Honor: Warfighter” a narrator says, “Who are we? Ask the Somali pirates. Ask the men who hide in Pakistani compounds. They’ll tell you. We’re the ones hunting the hunters,” amidst game footage of the game’s Tier-1 operators fighting terrorists in multiple dangerous hotspots. While there are some instances in these games where players can play enemy forces, the stories are driven by U.S. soldier or commando protagonists. This mimics America’s growing use of special operations forces to execute lethal actions against suspected terrorists around the world. The military benefits from this because “its recruits come in already partially trained,” says P.W. Singer in his book Wired for War. A generation that grew up playing video games will have the multitasking skills and technological savvy needed to operate the latest robotic weaponry that is the future of American warfare. On the other hand, there’s the risk of desensitizing the ugly reality of war with a game. War games have detailed weapons, incredible graphics, challenging missions, fun gameplay, and elaborate stories that immerse players in another world. This leads to an enjoyable experience for gamers. But this makes war seem “cool.” War’s reality is brutal and tragic. Joanna Polisena, whose brother was killed while serving in Iraq, said in a Gold Star Families Speak Out statement, “When our loved one’s ‘health meter’ dropped to ‘0’, they didn’t get to ‘retry’ the mission. When they took a bullet, they didn’t just get to pick up a health pack and keep ‘playing’…they suffered, they cried, they died.” In addition to large civilian deaths from the wars in Iraq and Afghanistan, U.S. drone strikes and other covert actions in Pakistan, Yemen, and Somalia have killed around 500 to 1,000 civilians and inflicted significant psychological harm. The bigger risk is the normalization of war in American society. The military is all volunteer. Combat troops have withdrawn from Iraq and are expected to leave Afghanistan by 2014. Meanwhile, the United States has institutionalized targeted killing and emphasized other instruments to wage the global war on terror, such as special operations forces, drones, and cyber-warfare. So far, Obama has launched 314 drone strikes in Pakistan and dozens more in Yemen and Somalia. Singer warns that “the nexus of video gaming, war, and militainment is growing even fuzzier with the rapid growth in unmanned systems that use video-gaming technology to conduct actual military operations.” Robotic warfare disconnects the public from war, as less troops are put in harm’s way, making lethal force an attractive foreign policy tool. As a result, war games, along with other forms of militainment, anesthetically normalize war in American society. Militainment makes perpetual war seem like an everyday phenomenon — one to be taken for granted and unquestioned. As the public, especially young males who are the target market for these games, becomes more desensitized and acquiescent to war, it’s worth scrutinizing militainment in video games, especially as “Call of Duty: Black Ops II” remains one of the most popular games. First published in Turnstyle News on April 17, 2013. Republished in AlterNet on May 6, 2013.